Alexander Copper and James Wort were merchant brewers in Burton-on-Trent before 1835. But within 10 to 15 years both the partners had passed away. Their descendants formed a public limited liability company in the late 1880's. Copper Wort & Co. Ltd. The company was later bought out and was amalgamated in 1910 with a larger company. Our period modelled of the early Edwardian 1900’s is perfect as that was the high point of the brewing industry in Burton on Trent, extremely busy with the bigger breweries establishing their potential with the Midland Railway network with the smaller breweries muscling in between them. Going smaller this time for my fourth project Copper Wort. It is being built to 4mm scale OO gauge on a hexagon shaped 6 board arrangement (4 feet length per hex outside edge) and is only about 1/3 size of my previous layouts. 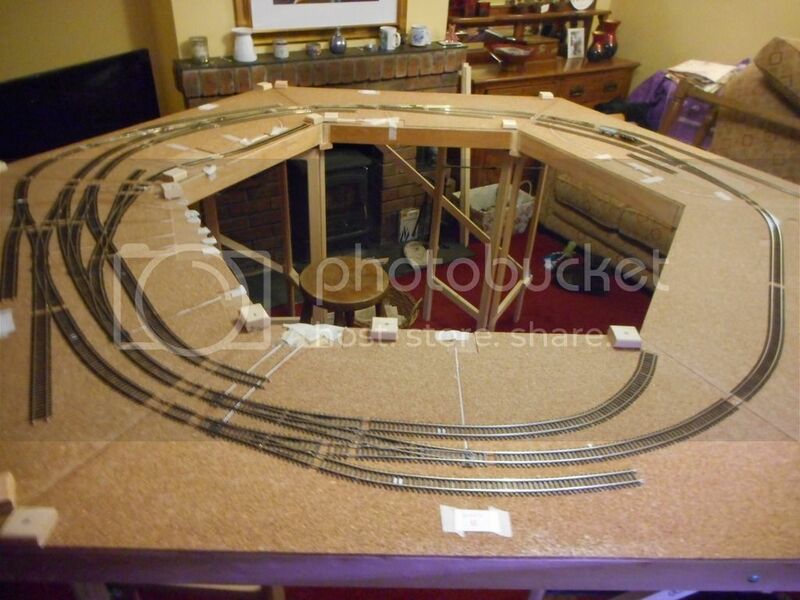 The track plan is a continuous round and round run with lots of shunting and sidings. 4 of the boards contain the complete brewery process. Board 5 is the High Street crossing with shops and houses with the track running between buildings, and board 6 a small fiddle yard. Most of the stock will therefore be out front. To add substance to what is essentially a little known small brewery company and make it work for a round and round layout I have given it a few of its own 0-4-0 locomotives to support the larger Midland Railway locomotives running through the town and includes a track plan based on Worthington’s arrangement to accommodate the numerous Midland Railway and Great Northern open wagons and outside framed Midland Railway vans. The buildings are based on the those of Bass, Ind Coope, Trumans and others, all based in and around Burton on Trent, some of which is still there today even though the railways have long gone. Assistance and advice has been gleaned so far from various people including Joe Stamper from Burton and the National Brewing Centre also at Burton. Boards constructed by Col Stark and we are currently under way with construction of the buildings together with the DCC electrics designs. Trackwork is all laid now. All higgledy piggledy - Just the job! Standard Peco Code 75. I shan't be doing any more scenic work at board level until all the wiring is complete and everything has been fully tested. Most of the track work will be covered in either blue setts or have gravel /ash ballast. I am trying to capture the main parts of a whole brewery, from malting's, brewery, to ale stores and banks, company offices, cooperage and cask washing bays, workers cottages together with a High Street single track crossing scene. I have converting some figures ready to install to give specific activity purpose to some cameos. This includes men pushing barrels, coopers hammering, foremen in bowlers, railway shunters with poles, sweepers, and a couple of lamp lighters. 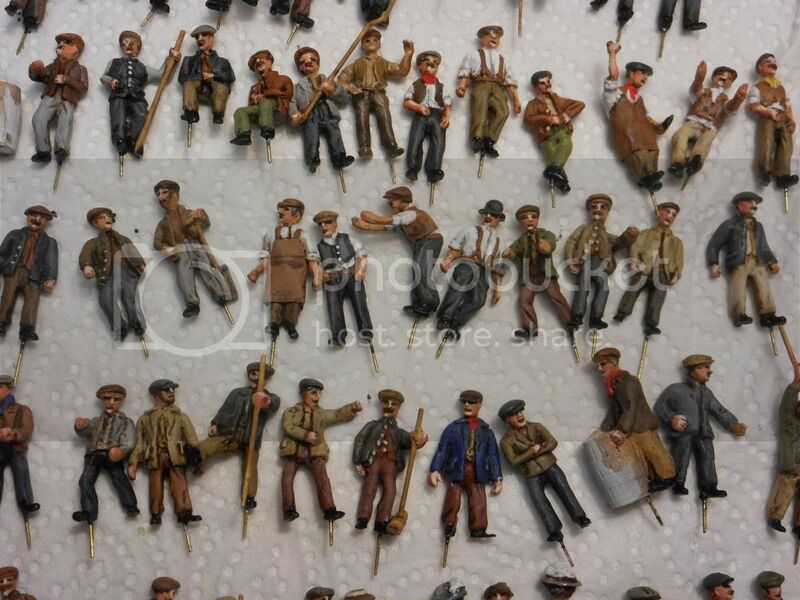 These figures are from our own range and simply have had new hats applied, bodies cut and re-angled, a few heads swopped, and some equipment added. Other conversions include some from Andrew Stadden's Edwardian figures range. Board B ad Board C buildings are now constructed including the engine shed, workers cottage and out-houses, stables, boiler house, coal store, gatehouse, engine house and steam cooperage. Some ground areas will be cobbled where the brewery work areas require hard ground surfaces and where entrances coincide with track work. Some of these areas are extensive so should look good. Other areas will be fine ash used as ballast as regular stone was not used in the inner town areas according to written words in books I am referencing. The problem is to do the cobbles very neatly as the OO gauge rail spacing doesn't allow for much un-slightly irregularity. Board 'A' will have a High Street scene complete with tramlines, single line crossing and overlapping gates. The book 'Brewery Railways of Burton on Trent' mentions tram line crossings rattling as trains crossed them, and also the crossings being focal points for rail alignment issues. I believe they may have been simple bolted connections until they made them more solid. The brewery buildings are now up to painting stage. 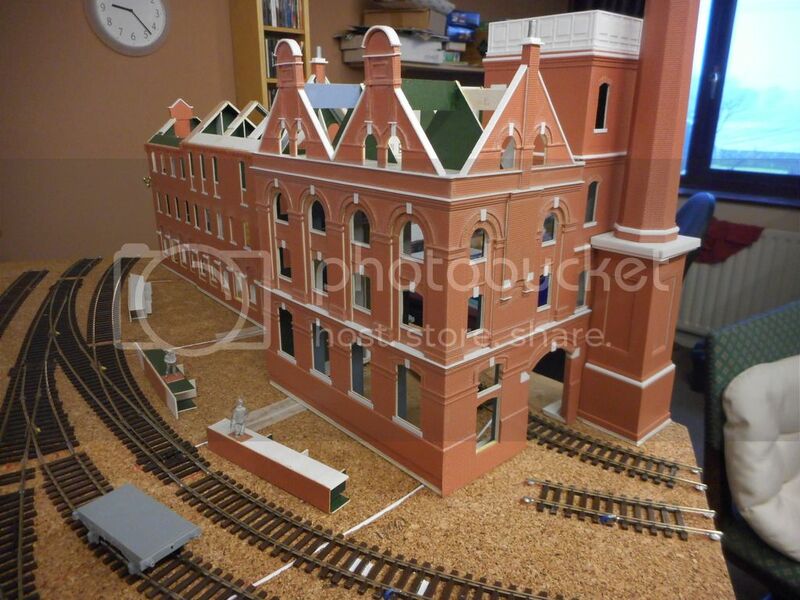 This building is based on the Ind Coope brewery building that remains today on Station Street in Burton. To the left of the main building are the union and racking rooms. There will be a bank in front of the building along its whole length served by a siding for wagons to draw up along for loading full casks. Another track goes inside the building which will be used for picking up spent grains and providing empty casks for re-filling which have come round from the washing area. 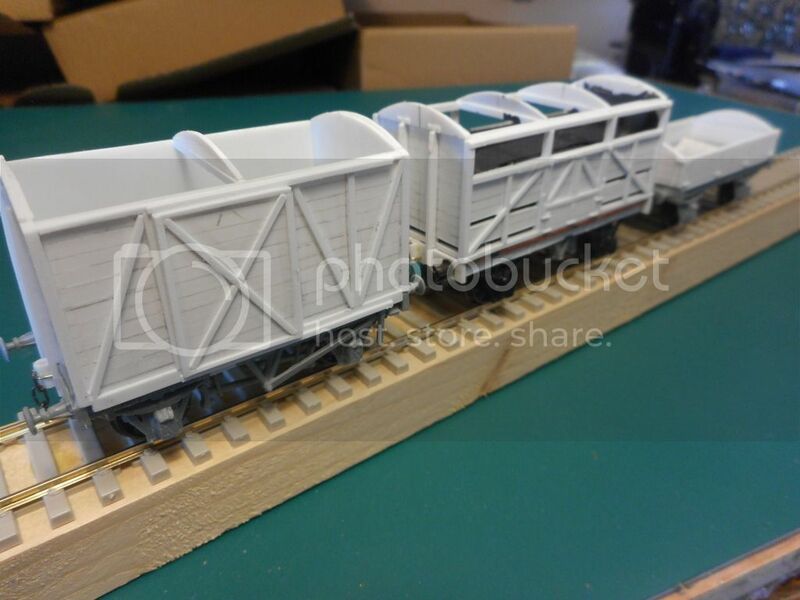 Wagon scratch building is complete. 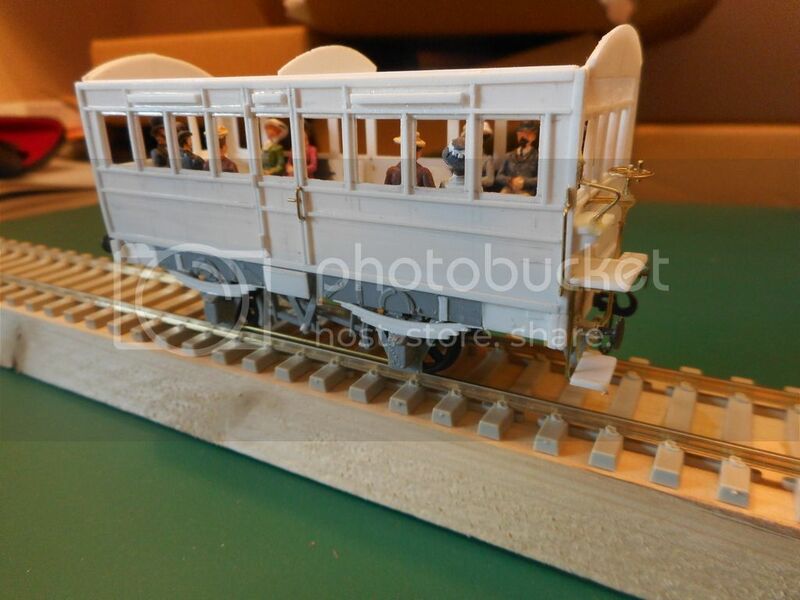 3 plank wagons and covered goods wagons built using plasticard and plastic strip sat on kit built plastic chassis. All the designs have been taken from the Midland Wagons Illustrated History book by R J Essery. The Directors Saloon has been scratch built using photographs taken at the National Brewery Museum in Burton in 2017. The occupants are Stadden seated Edwardian figures. The external raised guard seat will be occupied by a suitably converted figure.